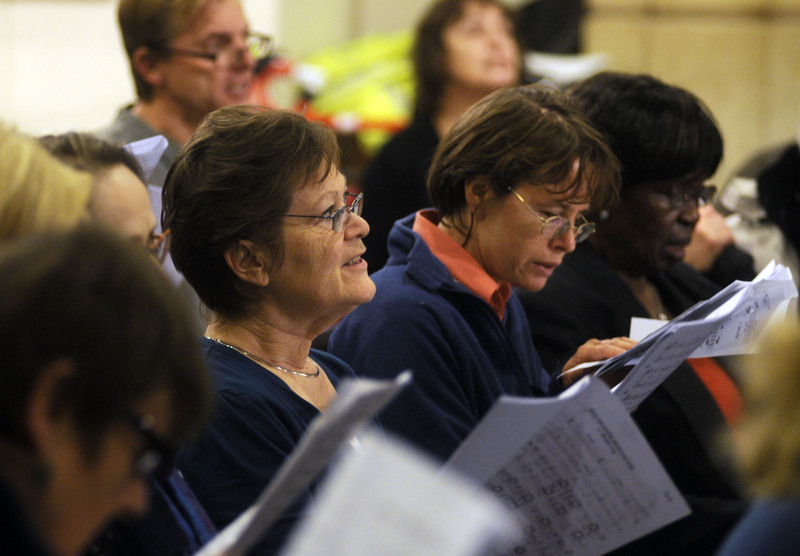 Vox Holloway (Latin — “the voice of Holloway”) is a community choral society founded in 2009 by Justin Butcher. 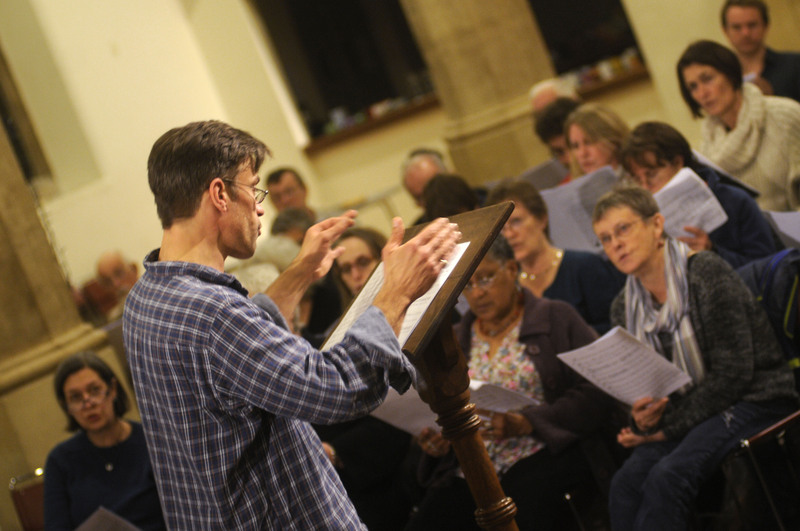 Vox Holloway is a choir open to all: there are no auditions and members are not required to have previous experience of choral singing, belong to any particular faith or live in any particular postcode. We do not have many places left for Sopranos and Altos, due to the fact that the stage area is full. Sopranos and Altos wishing to join should apply here with a short email saying why you would like to join Vox. There is still space for some Tenors and Basses. Click on video to see a film about Vox and our members. Harvey sang as a chorister at Coventry Cathedral before studying at the Royal Academy of Music and Clare College, Cambridge. Since then he has worked as a freelance performer, arranger, conductor, producer and composer. Harvey and the Wallbangers had great success in the 1980s throughout Europe, recording four albums and one called Jazz on EMI, with Simon Rattle. In September 2012 Harvey was made the Turner Sims Professor of Music at the University of Southampton. He started a new university community choir USV and has performed with students and professionals in concerts and workshops at the university. This post has been made permanent and he is now also an Associate Professor teaching a module in Community Music. 2017 sees the return of Harvey and the Wallbangers – a new lineup with three original members, who have played concerts in London and Southampton, appeared on In Tune (R3) and Front Row (R4) and gave festival performances in Bury St Edmunds (May) and Canterbury (October). Justin Butcher founded Vox Holloway in the autumn of 2009, as a community choir open to all, whose first concert raised £6,000 for a street children’s project in Durban, South Africa. Since 1992, Justin has been the Organist and Choirmaster of St Luke’s church, west Holloway, where the choir is based. His epic play Scaramouche Jones, starring the late Pete Postlethwaite, has been touring the globe since its premiere at the Dublin Theatre Festival 2001, has won and been nominated for several awards, translated and produced in five languages. In 2003 his anti-war satire The Madness Of George Dubya, hailed by The Guardian as the catalyst for the re-politicisation of British theatre, received unprecedented global media coverage, played to packed houses for five months in London’s West End, and along with its sequel A Weapons Inspector Calls, earned Justin the Fringe Report Best Political Dramatist Award. The third in the trilogy, Guantanamo Baywatch, was produced in the West End in the run-up to the November ’04 US Presidential election. His comic update of the Phaedra/Hippolytus legend, Breaking Strain, was a major hit at the 2003 Edinburgh Fringe, hailed by The Scotsman it as a “modern classic”. Other recent directing credits include: The Red Room (Union Theatre, London); The Winter’s Tale (Creation Theatre, Oxford); the Trade Justice Vigil, a huge multi-media event at Westminster Abbey for the 2005 Make Poverty History campaign, starring Vanessa Redgrave, Pete Postlethwaite, Damian Lewis, Ronan Keating, Beverley Knight and Jools Holland; his own re-working of the Mystery Plays, The Millennium Man (Theatre Royal, Bath & UK tour) and his own commedia-style passion play, King Of Fools (Westminster Abbey and five UK tours); Peter Shaffer’s Black Comedy (Colorado Festival of World Theatre, USA); Child Of Biafra (Contact Theatre, Manchester). He has also written five plays for BBC Radio 4: Chukwudebelu – Preserved Of God; The Man On The Pillar; The Seven White Masks Of Scaramouche Jones, starring Warren Mitchell, The Patience Of Mr Job and Escape From Gaza. In August ’08, he performed a highly-acclaimed run of Scaramouche Jones, directed and produced by Guy Masterson/Theatre Tours International, at the Assembly Rooms at the Edinburgh Fringe. This production toured the UK throughout 2009 and played the Adelaide Fringe Festival, Australia, 2010 and 2012, nominated for the Bank SA People’s Choice Award. His play, Go To Gaza, Drink The Sea, co-written and directed with Ahmed Masoud in response to the invasion of Gaza in January 2009, generated critical acclaim and controversy and transferred to the Assembly Rooms at the 2009 Edinburgh Fringe. His adaptation of Stanislav Stratiev’s Cold War satire The Roman Bath (Arcola Theatre, Apr-May ’10) was praised by Michael Billington in The Guardian and Michael Coveney in The Independent for introducing UK audiences to the work of a major Eastern European satirical writer. In Dec ’09 – Jan ’10, he performed in and directed the music for Phil Porter’s Cinderella at the Unicorn Theatre for Children. His first book, Jimmy – A Legacy Of Peace, the biography of Jimmy Mizen, published in May 2013 was described by The Guardian’s Erwin James as “One of the most moving books I have ever read.” His latest stage plays are Childhood In Berlin, a dramatisation of German-Jewish memoirs of pre-war Berlin, and The Last Great Quest, commissioned by the Wales Millennium Centre, Cardiff, to mark the centenary of Captain Scott’s Antarctic Expedition, scheduled to premiere in 2015, followed by UK and international touring. 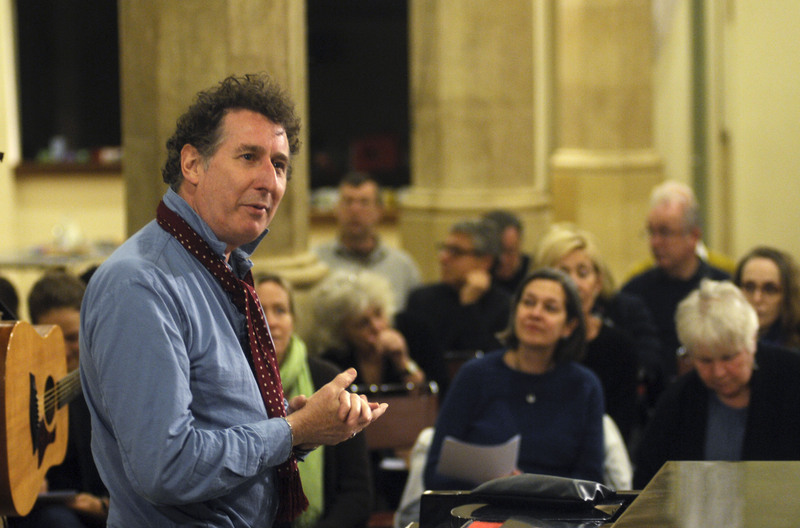 festival at St James’s Church, Piccadilly, over Christmas 2013, working with Nigel Kennedy, the Tallis Scholars, Yotam Ottolenghi and Sami Tamimi, Jeremy Hardy and Mark Steel, and a glittering programme of Palestinian, Israeli and British artists in a contemporary celebration of the life and culture of Bethlehem, to festival audiences of nearly 30,000 people and global coverage on television, radio, internet and social media. Some of the singers in Vox Holloway describe their experience of taking part in the choir. I’m a regular choral singer but a little weary of the standard big choir repertoire that comes round year after year. Finding Vox Holloway was a breath of fresh air – new and welcoming people, a new and inspiring musical director, and new music that I had never sung before! It’s somewhere I feel both challenged and at home. 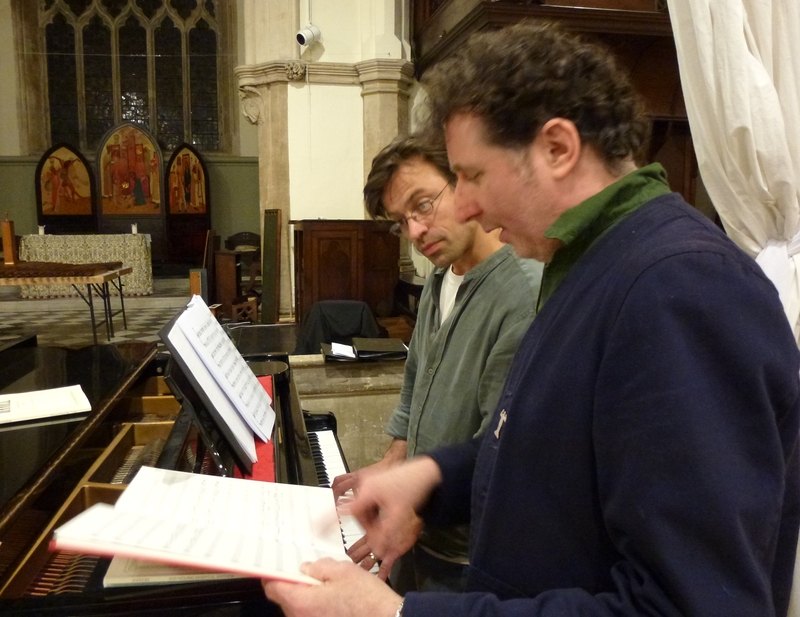 Joined in 2010 after an email came to me as a member of Hackney Singers – to sing Requiem in Blue by Harvey Brough. I have participated ever since. The music is always challenging and inspiring, often with fun elements added in, and the musical team are wonderful – you learn to really rely on yourself as a singer and just perform, rather than being a member of a large chorus. The opportunity is also there to sing along with fantastic professionals. I now look forward to what we will be asked to sing in the future – it is so rewarding. I joined Vox Holloway after trying several other local choirs in which I felt little sense of belonging or excitement. What makes Vox Holloway different is the friendliness and commitment of its singers; the drive and eclectic tastes of Justin and Harvey, the exciting mix of popular, rarely heard, and newly commissioned work; the fundraising efforts that lift us to a higher level of commitment; and the sense of camaraderie that results when a disparate group of people work hard together to create something beautiful, overcoming tiredness, lack of time, and the natural human inclination to let others work harder. I heard about VH from a friend I used to sing-a-long-a-showtune with. Vox Holloway is very local for me. 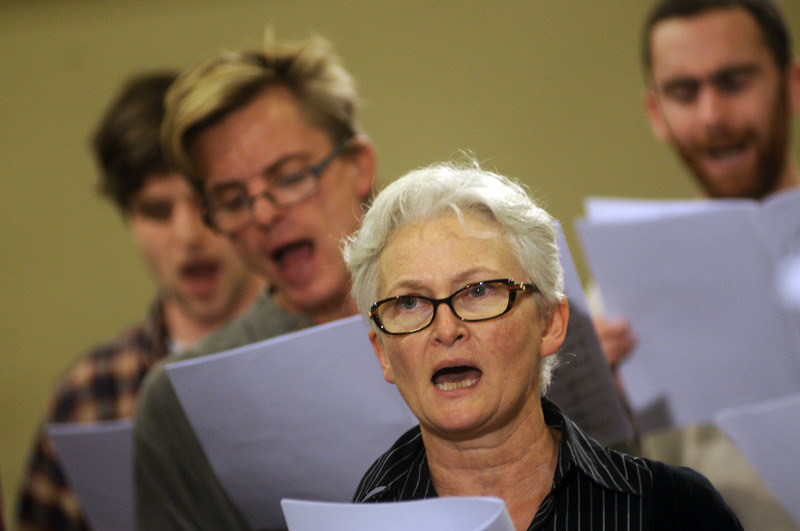 I’ve loved the range of work we’ve sung, some tricky, some fun and always rewarding. When I joined, I found I could still read music OK-ish (learnt 30 years before), but have learnt much more since. I don’t have perfect pitch and find harmonising a challenge, which gets easier each rehearsal. I’m also on the committee and I do this website, and manage the membership and mailing lists. I joined the choir after being at the concert Requiem in Blue. The Requiem was so beautiful I wanted to be a part of the choir. As a child I was brought up singing and listening to Latin and Choral Music. Vox Holloway has filled a hole in my life. There is a challenge in all the pieces we sing especially as I do not read music. Other members have been supportive, and also the musical direction given is very helpful. Vox Holloway is very important for my well being enabling me to escape from the trials and tribulations of every day life and to express myself through art. Making music with a group of like minded people is probably the nicest way of socialising. My Tuesday evenings are sacrosanct – set aside for Vox Holloway and 2 hours of serious work that always results in something magnificent. I put aside all work and other concerns and become absorbed in the joy of creating something beautiful with other local people who just love singing. There’s nothing pretentious about our choir – its welcoming, friendly and supportive of anyone who wants to come on board, and that makes it very special.